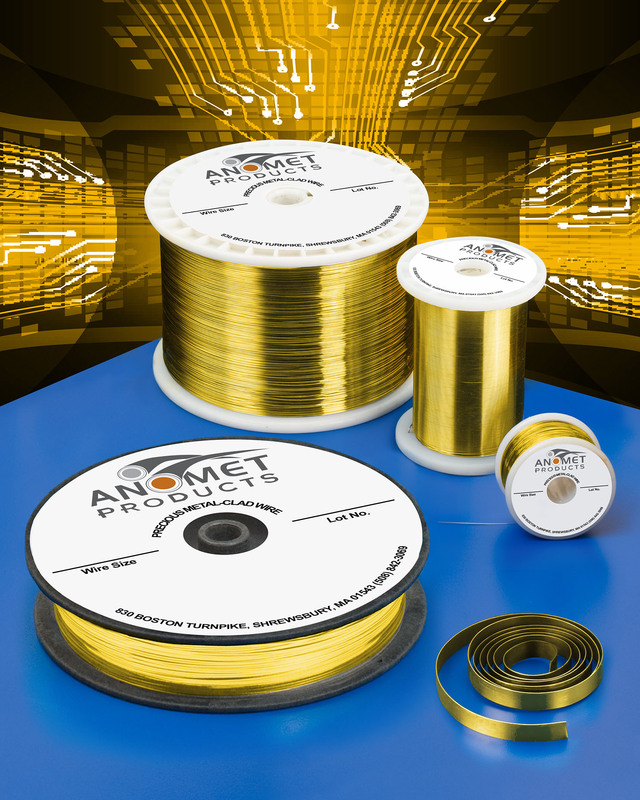 Custom manufactured composite clad metal gold and gold-alloy wire that is superior to electro-plated wire for a wide range of electronic applications is available from Anomet Products, Inc. of Shrewsbury, Massachusetts, USA. Anomet Gold & Gold Alloy Composite Wire and Strip are clad over copper and copper alloy substrates and metallurgically bonded featuring a smooth, consistent surface finish, with greater ductility and formability than electroplated products. Functionally equivalent to solid products, these clad metal products are ideally suited for high-reliability electronics. Designed for use in micro-switches and rotary connectors, and ideal for fabricating coils and hermetic devices, Anomet Gold & Gold Alloy Composite Wire and Strip is conductive, solderable, formable, and corrosion-resistant. Typically incorporating 2% or more cladding thickness, they are uniformly dense and will not crack or flake. Sizes start at 0.002” (0.05mm) O.D. Anomet Gold & Gold Alloy Composite Wire and Strip are typically 10X less expensive than solid precious metal products. Price quotations and samples are available.